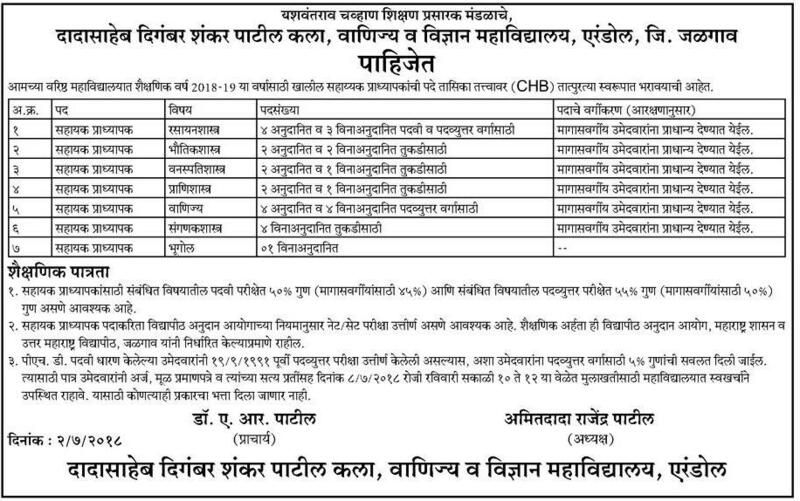 DDSP College Jalgaon (Dadasaheb Digambar Shankar Patil Arts Commerce and Science College), Jalgaon Published Job Notification for Assistant Professor Posts. Candidates who wish to apply must look at DDSP College Jalgaon Assistant Professor Recruitment 2018. Eligible candidates can join walk-in Interview on 08-07-2018. Interested & Eligible candidates may attend for walk in interview along with all the documents addressed at Dadasaheb Digambar Shankar Patil Arts Commerce and Science College, Mhasawad Road, Erandol – 425109, Dist. Jalgaon, State : Maharashtra, India. Starting Date, Last Date to Apply Offline at Dadasaheb Digambar Shankar Patil Arts Commerce and Science College which candidates should be remembers as follows.